Meatballs made with Waitrose Extra Lean Ground Beef, and served with tomato sauce, make a perfect, simple supper for all the family. Serve with spaghetti or any other pasta and a green salad. Heat half the oil in a large saucepan. Add the onions and garlic and cook gently for 10 minutes or until soft. Transfer half the onion and garlic mixture to a large bowl and set aside. Add the tomatoes and sugar to the remaining mixture in the pan, season and simmer gently for 5 minutes. Add the breadcrumbs, beef and pesto to the onion in the bowl and season. Mix well until thoroughly combined. On a floured board, roll the mixture into walnut-sized balls, pressing firmly together. 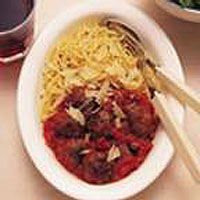 Heat the remaining oil in a frying pan, add the meatballs in batches and fry until browned, firm and thoroughly cooked. Drain on kitchen paper. Add to the tomato sauce, cover and simmer for 20 minutes. Serve with spaghetti and grated Parmesan cheese. For a Turkish version, make the meatball mixture as above but omit the pesto and season with ground cinnamon, ground cumin and chopped fresh mint. Form into slightly larger balls and flatten to make patties. Fry until thoroughly cooked then serve in pitta bread pockets with Greek yogurt and salad.